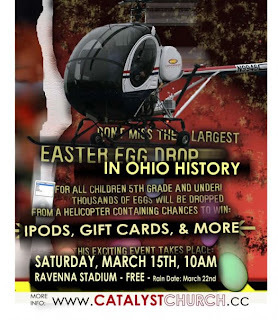 Editor’s Note: At the request of the Ravenna School District and due to weather conditions on the ground, the Easter Egg Helicopter Drop has been rescheduled for the next weekend, Saturday, March 22, 10 a.m., at Ravenna Football Stadium (Easter Weekend). Also, to help speed the registration process that morning, a pre-registration form has been added to the church website. Catalyst Church in downtown Kent, Ohio, is doing everything it can to build relationships to further the kingdom of God. To help bridge the gap between someone who is far from God and the church, it is hosting a free community Easter Egg Helicopter Drop on Saturday, March 15 at Ravenna Stadium. The stadium is located at 6589 North Chestnut Street in Ravenna, Ohio. Registration starts at 10 a.m. and is open to children in fifth grade and younger. “We want to build visibility and relationships with people so that when faced with a spiritual need, they will think of Catalyst Church first,” says Jonathan Herron, lead pastor at the developing church. An estimated 4,000 Easter eggs will be loaded with candy (and a few iPods) and spread across several fields for the different age groups. Then a few hundred more eggs will be dropped from a helicopter. Catalyst is a Grace Brethren church plant that meets at the Kent Stage in downtown Kent. More than 100 people are involved after only 16 months of existence and it has continually sought to engage and create culture. Last year, the Easter Egg Drop was created only 10 days before the event, yet 600 people heard by word-of-mouth and showed up. This year, the church knew it needed a bigger and better location if it was going to reach more people. Herron expects 1,000 people to come to this year’s event. Every person who attends will leave with a special invitation to attend Catalyst. Click here to see the Facebook invitation for the East Egg Drop.